The field of economics is a broad discipline that deals with the production, supply, and consumption of goods and services. The field analyzes the interaction among consumers, suppliers, goods, industries, etc. to discover trends that are used to devise better policies. It is an amalgamation of microeconomics, consumers and their behavior, and macroeconomics, the effect of overall consumer behavior on aggregate outcomes. People looking for growth in their present careers such as marketing, business, etc. should opt for a certificate in economics as it provides them with extensive knowledge to examine trends and devise better policies, which is a vital addition to their repertoire of skills. Institutes all across the country are offering economics at undergraduate, graduate, and post-graduate level. There are many reasons why students are pursuing this field academically. Economics is a challenging subject that requires proficiency in mathematics. The subject is normally offered at the post-graduate level; however, some schools do offer a certificate in economics to students in a bachelor program specializing in some other major. Hence, opportunity is provided to people specializing in other subjects like mathematics, computer science, marketing, healthcare administration, etc. to obtain training in basic economics that helps them significantly in further succeeding in their careers. Many schools also offer a certificate of economics with specialization in a particular subfield of economics such as financial economics, which deals with financial analysis and cash-flow, and behavioral economics, which studies the behavior of investors. Such a certificate is ideal for people in the field of marketing, business administration, management, etc. Moreover, they can earn such certificates via e-learning as many schools offer distance learning options. This course will allow students to learn about the process of forecasting economic trends. The course will highlight major indicators, statistical models, and variables. This course will cover areas such as consumer theory, risk and behavior, producer theory, general equilibrium, and partial equilibrium. Students will learn about theory through relevant applications. This field of economics discusses in detail the behavior of firms and their regulatory policies. Students will learn about different aspects of the field such as employee selection, productivity, performance, and organizational development. This course is designed to provide students with in-depth knowledge of how businesses benefit from the “network effect”. Students will understand how and why prices of goods/services affect their demand. This course will provide students with knowledge about structure and economic functions of a nation or region as a whole. Students will learn about the behavior and decision-making processes, resource allocation, gross domestic products, and will also learn about issues such as unemployment. Economic development is a branch of economics that deals with aspects or policies used to promote the standard of living in communities. Students will learn about the distribution of wealth, financial economic health, and actions related to policy-makers. This course will broadly cover the economic aspects of urban area. Students will learn about the tools used for analyzing economic issues. Topics covered in the course include local government finance, education, crime, housing, and spatial structure. The admission requirements will depend upon which institute you wish to enroll in. Each university or college has its own set of admission criteria. Job duties: Study and analyze data regarding production and distribution of goods, resources, and services. Evaluate, research, and forecast economic trends. Job duties: Provide guidance to individuals and businesses regarding investment decisions. Job duties: Use different statistical methods to collect and analyze data. How long does it take to get an economics certification? Certifications in economics are offered by various institutions across the US. For instance, a graduate certificate in Economics could last half a year, on a full-time basis. Undergraduate certificate options are also available. You will need to consider the level of certification and the institution you want to go for, when deciding on an economics certification. What are the requirements to get an economics certification? The requirements for the completion of an economics certification would depend on the program you choose. Typically, certificate programs at the undergraduate level would require you to complete basic courses in economics, financial accounting principles, business information systems and commercial law, among others. Higher level certificates will need you to clear more advanced courses. How much can I make with an economics certification? With an education in economics, you can choose from a variety of career paths. You may choose to become an Actuarial Analyst, a Chartered Accountant, a Data Analyst, an Economist, and a Financial Risk Analyst and so on. The amount of salary you earn will depend on your educational qualifications and job title. Q:I want to know the topics I'll get to study in Certificate course in Economics, can you guide me? A:You will get to study a number of courses in Certificate Course in Economics. Some of the topics you might come across include, intermediate mathematical economics, resource & environmental economics, public economics, thinking strategically, international economic history, international trade and investment policy, the economics of climate change and East Asian economies. Q:What are the benefits of enrolling in a online schools for a Certificate In Economics? A:Online education has benefits of its own. If you plan to pursue online education you will have various advantages such as the following: low costs of the program, no transportation required, no extra costs of books or study materials, flexibility of time as you can study at whatever time suits you best, you can also easily work fulltime or part time without having to worry about missing classes etc. Q:If I enroll in an economics certificate online, will it help my career? A:Yes, a certificate in economics is a great way to boost your career. This program certifies an individual in a specific area/task/job. If you are already employed in an organization, you can boost your employment opportunities by acquiring an economics certificate. A certificate credential can increase your earning potential and also help you update your skill set. Q:Can you give me some information about an economics certificate program? A:A certificate program is a credential a student can earn in economics. The program is designed to provide students with knowledge and career related skills that can help in their careers. These programs usually take 6-12 months to complete, and can also be completed online through accredited online economic schools. Q:Are there any schools offering certificate courses in economics? A:Yes, there are a number of accredited schools offering certificate courses in economics. These are short courses that can be pursued by professionals and students. Students can also opt for certificate programs online, for convenience, ease, and low costs. Certificate courses in economics are usually either pots grad, or undergrad. Q:Is a certification in economics good for improving my career? A:Yes, a certification program can help you pursue better career opportunities. This program will certify you in a specific field or task. Many employers are seeking individuals who have earned certifications along with degree programs. The coursework is career-oriented and can also be pursued online. Browse further for more information. 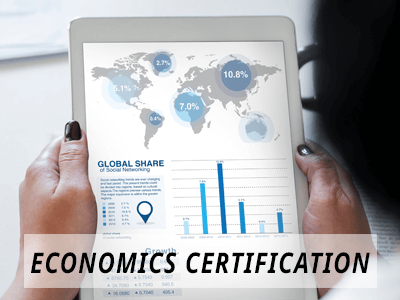 Q:What is a Certificate Economics designed for? A:Certification programs are designed to certify individuals in a specific field. These are short courses and are offered in all academic fields such as economics. The program has a short duration and can also be pursued online. Many employers are seeking certified individuals nowadays. Take a look at our page for more detailed information.